Specify which battlebacks appear when a battle is started depending on what terrain tag (or region) the player is standing on. Adds the ability to display windows on the map scene with some very basic details about armor or weapons from the database. There can be multiple windows open at one time and you can set show choices box to change a single window depending on which choice selection the cursor is over. A new scene that shows a custom map graphic (that you will need to create) and a list of locations that can be added/removed/changed from the map during gameplay. The map can be moved around using mouse or keyboard controls and each location can change 3 variables to allow you to use the “Transfer” event command to transfer to a designated mapid and x,y position on that map. This plugin gives the illusion of pixel movement for the player but tries to retain all normal tile-based functionality of the game otherwise. Instead of moving from tile to tile, the player moves on 9 segments within each tile. Events still retain their normal tile-based movement and functionality. A simple image pre-loading plugin that enables to to specify images from folders within /img/ folder to pre-load (pre-cache) when the game is loading or to use a script call to cache images during game before they are needed. 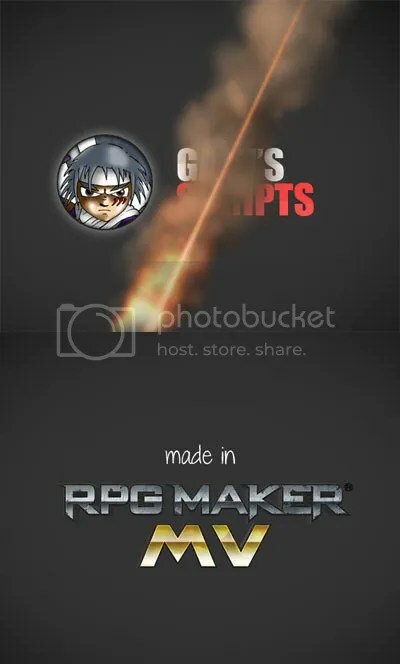 This can be useful as RPG Maker MV loads images into memory as soon as they are needed during gameplay but sometimes this can cause issues such as images flashing blank for a moment, lag, or sometimes not loading at all. This plugin enables you to call a set common event automatically when the timer ends which you can change during the game. This can also disable the default ‘abort battle’ functionality when the timer ends so the player doesn’t have to be forced out of a battle they are in the middle of. This plugin allows you to specify regions with random encounters that are chosen from any previously defeated troop. A comment can be added to troops that you do not wish to appear in this list (such as bosses perhaps). This plugin allows you to zoom the screen to a certain x,y pixel location, scale and taking a certain duration to do it. Only map and map sprites will be affected by the zoom – window message and other scenes will not. The zoomed screen can be moved around by calling the script again with different x,y position or scale. NOTE: This is a SCREEN zoom plugin, it only changes the camera zoom of the screen. It doesn’t scroll the map or allow you to see more of the map than the screen size permits normally. So for example, if you zoom out smaller than default 100% scale there will be black around the map. Just a tiny plugin that adds a pause after a ‘show choice’ list is displayed where the player cannot select a choice. The idea for this is to prevent players from accidentally selecting the first choice if they are pressing the action button too quickly through messages. Enables the player to takeoff and land like superman with the press of a button. Uses a different characterset for flying and the flight button can be enabled/disabled during game. Add traits to actors during the game via script call or use note tags on actors or classes to specify traits that can be gained when reaching certain levels. This plugin changes menus (skill, item, main menu) to skip the actor select step when there is only one actor in the party. This was a quick one designed for the default menus. Any custom menu plugins you have may not be compatible with this. Actors have a weapon proficiency for each weapon type. This weapon proficiency can raise the hit chance, crit chance or have an effect on damage with a change to the damage formula for physical attack skills while they are wielding a weapon of that weapon type. Weapon proficiency for the currently wielded weapon can be increased by attacking in combat or manually via script command. Each class can have different maximum proficiency for each weapon type. An animation can play during battle when an actor’s weapon proficiency skill increases. Players can see their weapon proficiency in the default status menu or in Yanfly’s status menu if either of these are set in the plugin settings. Change a picture on screen depending on which choice is highlighted in a ‘Show Choice’ event command. Add buttons to the screen on specified or all maps that can be set to emulate button presses, run script code or run a common event (press and hold or triggered). Create or remove any number of buttons during the game. Includes a setting to disable map mouse-click movement if you wish to use buttons for arrow keys (example in demo). Can enable/disable buttons during game or have buttons disappear or stay during events such as ‘Show Text’ dialogue. Keyboard can not control these buttons, they are for mouse or touch activation only. This plugin creates a tool system, where the player can cycle between items that are designated as tools and press a button to use the tool that is selected on the screen. The basis behind this plugin is to allow players to event what happens when a tool is used, giving the player script calls to use to assist them with tool functionality. Each tool activates a common event to control this. This plugin requires database and eventing knowledge. 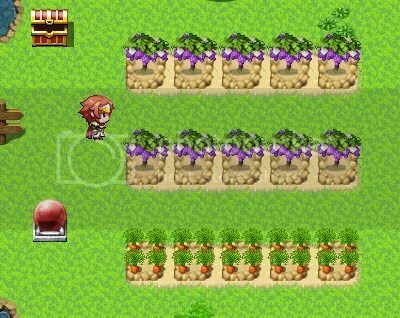 This plugin allows the player to plant and grow crops in designated plots by selecting seeds from their inventory. It’s labelled as simple crops because the gameplay is simple, not because it’s simple to set up. You’ll need to use eventing and database item knowledge to control how it works. When paired with my MV Tools plugin, you can set up tools to control planting/watering and other manipulation of the crops (also with eventing). Another quest log plugin! Just to give you guys more options. Create quests with objectives and display each as complete or failed as the quest goes on. Quest details are stored in a .txt file within your project. Sort quests into categories that can be expanded/hidden by the player as desired. Use script calls to check results of quests and objectives to potentially save on switches/variables. Player can track a quest, making it appear in the quest log when no other quest is selected to quickly reference it during game. Quest update notification can be done manually or automatically if using Galv’s Timed Message Popups (included in demo as example). 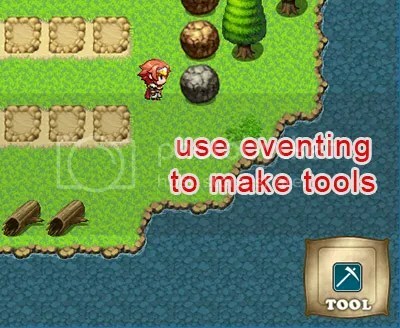 This plugin adds a new fishing mini game to your project similar to that of Breath of Fire 2’s. This plugin is not plug-and-play and requires setting up. It may be difficult for new users. – Add specific fish or objects or randomize them for each fishing spot. Use eventing to add quest items to catch from the water. The demo contains examples of some things you can do. – Copy the “GALV_Fishing.js” file into your project’s /js/plugins/ folder. The demo fish were created by Matt Beer. Use comments in a troop page to assign that troop a condition for it to appear in random encounters. This condition can be a switch on/off, a variable above a certain number or if there are a certain number of items in the inventory. 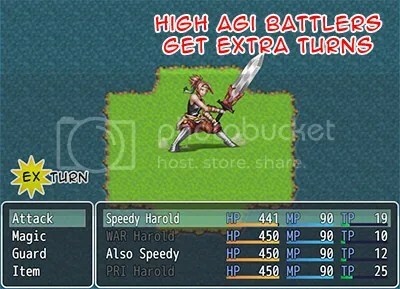 Much like Breath of Fire 3, Battlers with a high AGI parameter can get extra turns between normal battle turns. This is based on a % amount higher a battler is than the average agility of the opposing team. These extra turns do not advance states/poison/regen etc. This is not compatible with battle systems that modify turns (such as ATB or immediate action systems). Set up weapons, skills or battlers to apply states to the enemy or themselves when a critical hit or a miss happens during battle. This plugin changes how level ups work in your project. Instead of levelling up normally when a character reaches the required exp for next level, the player will instead be required to manually level them up from a new scene that can be accessed via the status screen or script call. 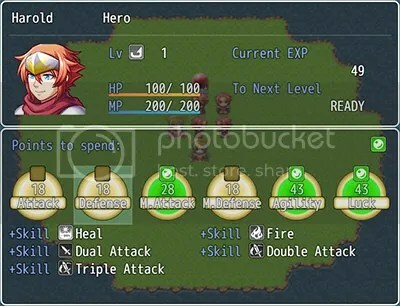 The manual level up screen displays skills and parameters that will be acquired as well as a number of points the player can spend to boost chosen parameters. Each parameter can have one point placed in it which will increase it by a designated amount (which can vary for different classes). Create projectiles that can interact with player and events using script calls. These projectiles can be fired from the player or an event and set to shoot in a direction, at a target or toward the mouse position. Settings can be used to control which projectiles will hit or run an action on other events, which terrain tag or region id tiles block them, different actions they will do when then hit the player or an event and more. Can use battleback graphics that contain multiple frames to cycle through for animation. I advise using sparingly as the files can become quite large and add a lot to loading times if too many frames are used (a precaching plugin might be worth looking into if that is the case). The upper battleback and lower battleback can be mixed together with animated or not animated backgrounds. This plugin allows you to notetag skills to make enemies slightly smarter and use those skills only if a certain condition is met and only on certain targets. This includes having heal skills that enemies will use only on their allies that are hurt, using a special attack skill only on actors that have a certain state, etc. 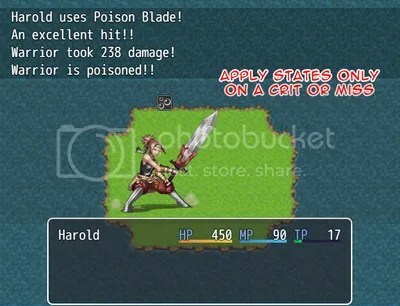 These conditions work with the default ‘rating’ system RPG Maker uses to determine which skill an enemy will use, allowing a basic way to increase enemy AI during battles through these priority skill conditions. A simple plugin that allows you to play animations from the database on pictures created with the “Show Picture” event command. This plugin adds some functions to use that may help with eventing puzzles and/or quests. 2. Determine location without having to use Control Variables beforehand. Check if the player has activated the events in the right order set in the combination specified. Check if there are multiple items, armors, weapons in inventory using code with only one conditional branch. Simple examples of all of the above can be seen in the demo. Adds basic functionality to check if events are within a certain distance of the player and if the player is in 180 degree line of sight. In addition, behaviors can be set up for events to automatically act differently when detecting and not detecting, such as guards chasing when detecting the player and returning to their start location when they lose sight of them (this uses default pathfinding code so does not do long distances well). Enables code to use in conditional branches to make an event run different commands depending on how the event was triggered. For example, when an event’s trigger is set to “Event Touch”, it can be run when the event collides with the player, when the player collides with the event or when the player presses the action button. A different outcome can happen for each trigger method. A separate scene that can display scrolling/fading text as well as background images. It can be run any time during game or from the title menu, taking text/data from a .txt file in your project files. 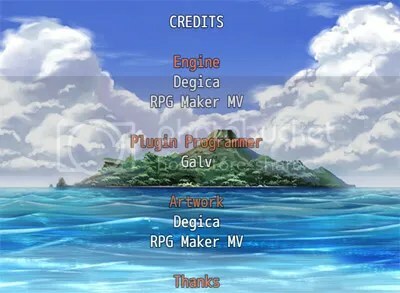 Designed to be used as a simple way to display credits but could be used for other purposes. 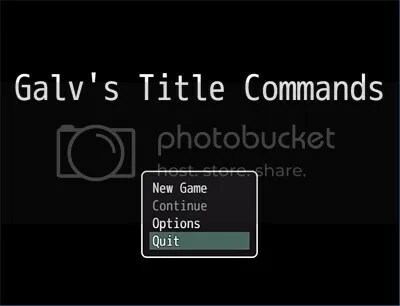 A plugin that allows you set up what commands display in the title menu, what order they display in and under what condition they will display. Also included is an option to change the title menu completely when a certain condition is met. This plugin changes movement so that when the player taps a direction that he/she is not already facing then they will turn on the spot instead of moving. If moving, dashing or already facing the direction of movement, there will be no delay and walking will happen as normal so as to keep movement as fluid as possible. This plugin does not take into account mouse movement. Adds a New Game+ feature to allow the player to start a new game that uses specified data (such as gold, items, variables, switches, actors, etc.) from a save file. After the player encounters where you placed the activate code and then saves the game, the New Game+ option will be added to the title menu. 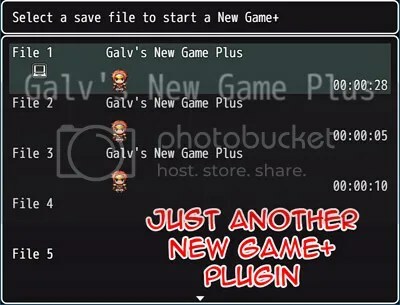 – The player can only start a new game using a save file that has had it activated during the game. – Settings include lists of items, switches, variables, actors, etc. that allow you to control what data is and is not transferred over when starting a new game plus. 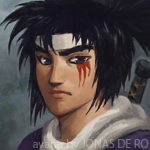 – The number of playthroughs is recorded to use if required during game. A super simple one. If you don’t want dash to be a mechanic in your game you can disable/enable it with this plugin. It can also remove the “Always Dash” setting from the options menu. This plugin adds the ability to duplicate/spawn events from a specified “Spawn Map” to the current map the player is on. These events can be temporary (which disappear when player leaves the map) or permanent (they remain even when player leaves the map and returns) and can be cleared with script commands if required. Events can be spawned to a specific x,y location or a random tile with specified region ID. This plugin makes changes that make each actor able to equip and hold a certain amount of items. In battle, actors only have access to the items that they currently have equipped. Outside of battle the party inventory works as usual. 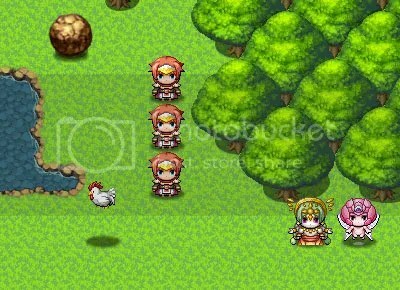 A new scene can be added to the menu for the player to equip items to their actors. Create multiple images that display one after the other in order before the title screen appears. These images can have an animation played on them, which allows you to create static or animated logos or other images as splash screens. Includes options to skip each logo individually, skip all or disable skipping. 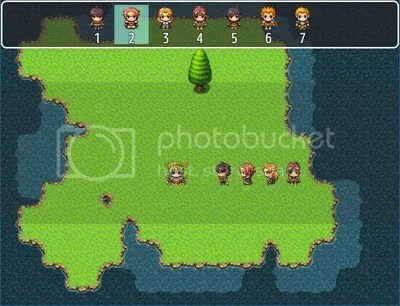 Press a button on the map to bring up a list of up to 10 party members. Pressing the numbers associated with each actor allows you to change the formation quickly without pausing the game.